Gimbap (or kimbap) is the most popular on-the-go meal in Korea! Learn how to make classic gimbap at home with my step-by-step guide! What is gimbap (or kimbap)? 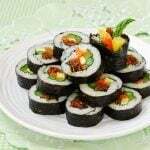 Gimbap (김밥) is a Korean seaweed rice roll filled with a variety of delicious fillings. Gim is dried sheets of seaweed, and bap means rice. We all grew up on these rice rolls. They were a must for our school field trips and outdoor activities as well as family road trips! Whether it’s the anticipation the night before or watching the early morning preparation by mom to pack these in lunch boxes, there is no other dish that takes me back to my childhood like these gimbap rolls! 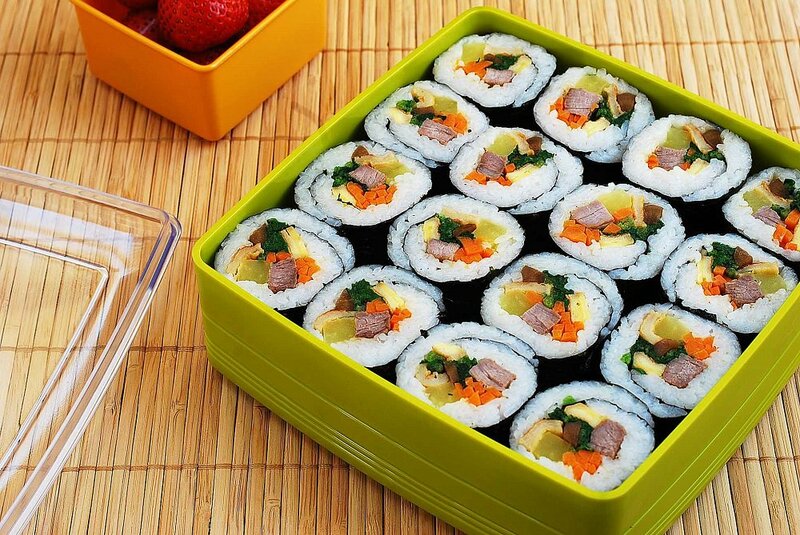 Today, gimbap is the most popular on-the-go meal in Korea. They are practically sold everywhere and are popular with adults and kids alike. Try them yourself and be prepared to fall in love with these delicious Korean rice rolls. This gimbap recipe was originally posted in May 2012. I’ve updated it here with more information, new photos and minor changes to the recipe. There are many variations of gimbap these days, but the best one for me is classic gimbap my mother used to make for us on our field trip/picnic days. It takes some time to prepare the individual fillings, but the process is easy and fun. 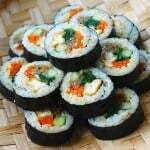 Gimbap rice is typically made with white, short grain rice. For healthier options, you can mix in some brown rice or multi-grain rice. It’s important to cook the rice slightly drier than normal by using a bit less water. Traditionally, gimbap rice is lightly seasoned with sesame oil and salt for a nutty flavor and a savory note. For making gimbap, seaweed sheets need to be slightly thick to be able to hold the rice and all the fillings. They are also lightly roasted. 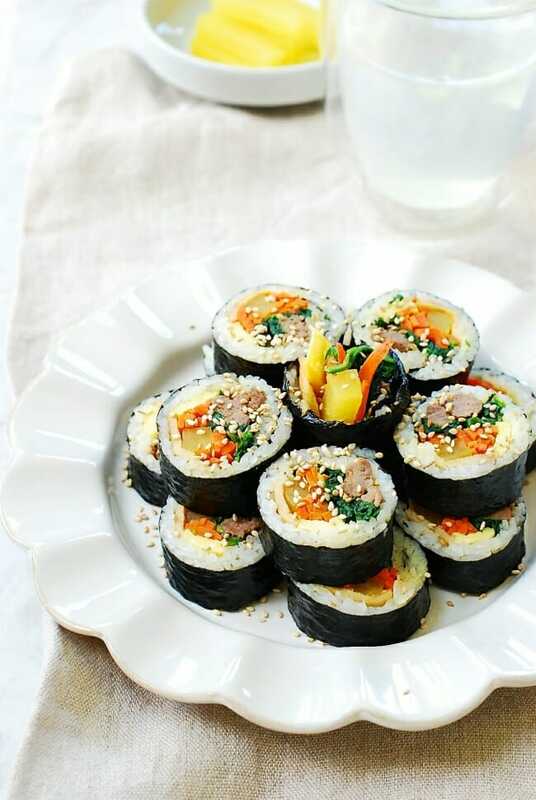 You can find seaweed sheets specially prepared for gimbap at Korean markets. 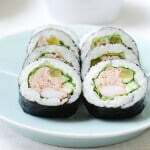 Although gimbap fillings have evolved to include all sorts of things, the classic ingredients are yellow pickled radish (danmuji), eomuk (fish cake), carrots, spinach, eggs, and beef. You can use any tender cut of beef. Thin bulgogi meat or ground beef works fine as well. Braised burdock root (우엉) is also commonly used in classic gimbap. You can usually find packages burdock root pre-prepared for gimbap next to yellow pickled radishes (danmuji). Or, you can make your own, using my recipe. The fillings are individually seasoned and cooked, yielding an interesting combination of textures and flavors. Everything is well seasoned, so gimbap typically is not served with a sauce. How hard is the rolling process? It takes some practice, but don’t be scared! You’ll find it much easier with your second roll. Just remember to roll it tightly by putting firm, even pressure with your hands all over the roll. Freshly cooked rice is best for making gimbap. 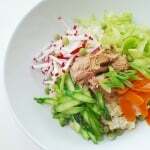 Start preparing the recipe by making the rice, and mix with sesame oil and salt while the rice is still warm. Wet your fingers before spreading the rice onto the seaweed to prevent the rice from sticking to your hands. It’s easiest to have a small bowl with water next to your rolling-station so that you can wet your hand in between rolls. Use a sharp knife for cutting your rolls. You need to make a clean slicing motion and make the full slice in one go without pressing on the roll. Store your sliced gimbap in an airtight container. Gimbap is best eaten on the day it’s made, but you can keep it in the fridge and reheat either in the microwave or in a pan. Sometimes, we dip refrigerated gimbap in egg batter and pan fry. A delicious way to revive gimbap! 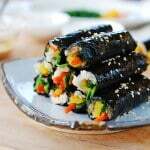 Did you make and love this gimbap recipe? Please rate the recipe below by either clicking the stars or with a comment! And make sure to share your creations by tagging me on Instagram! Stay in touch by following me on Pinterest, Twitter, Facebook, and Instagram. 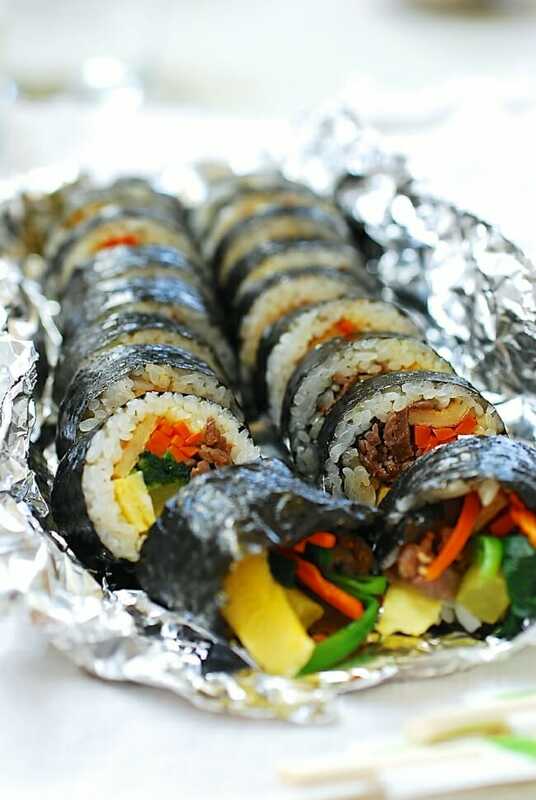 Gimbap (or kimbap) is Korean rice rolls. The sesame oil flavored rice and colorful fillings are rolled in a seaweed sheet. Learn how to make classic gimbap at home with my step-by-step guide! Cut the beef into thin strips (about 1/2-inch thick). Mix well with the next 5 seasoning ingredients. Stir-fry over medium-high heat until cooked through, 2 - 3 minutes. Bring a large pot of water to a boil over high heat and prepare an ice bath. Blanch the spinach, place immediately in the ice bath, then squeeze out water. Season with the sesame oil and salt. Julienne the carrots. Heat a lightly oiled pan over medium-high heat. Stir-fry the carrots until softened. Lightly season with a pinch of salt. Cut the pickled radish lengthwise into 1/2-inch thick strips (unless you bought a pre-cut package). Crack and beat the eggs, in a bowl with a spoon or a fork. Stir in a pinch of salt. Heat a small non-stick pan over medium-low heat. Add the eggs to the pan. When the bottom is set, flip it over. Transfer to a cutting board. Cut lengthwise into 3/4-inch thick strips. Cut the fish cake lengthwise into 3/4-inch thick strips. Heat the pan with a little bit of oil over medium heat. Stir fry with the soy sauce, sugar, sesame oil and a little bit (about 1 teaspoon) of vegetable oil over medium heat until softened, about 2 minutes. 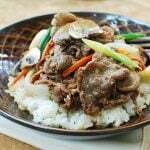 Arrange all the ingredients together on a plate.When all the other ingredients are ready, remove the rice from the rice cooker. While the rice is still hot, add the sesame oil and salt. Mix well by lightly folding with a rice paddle or large spoon until evenly seasoned. Add more salt to taste. The rice will cool down during this process and be ready to be used. Put a sheet of nori, shiny side down and longer side towards you, on a cutting board or a bamboo mat if available. Spread about 3/4 cup to 1 cup of rice evenly over the seaweed sheet, using a rice paddle or your fingers preferably. 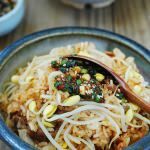 Lay the prepared ingredients on top of the rice close to the side toward you. Put firm pressure over the roll with the help of the bamboo mat, if using, to close everything in tightly. Then, continue to roll again, putting pressure evenly over the roll using both hands. Rub or brush the roll with a little bit of sesame oil for extra flavor and shiny look. Apply a little bit of sesame oil to a sharp knife. (This will keep rice from sticking to the knife. Repeat as necessary after each cut. Wipe the knife with a damp towel if the rice still sticks.) Cut the roll into 1/2-inch thick bite sizes. Wow I’ve never had rolls like this – it’s like Korean sushi! I would absolutely love this. Great picnic post! I love this with a beef! I never had this kind of rolls before! Awesome job and thanks for sharing gimbap with us! Sandra – Thank you! Hope you get to try it one day.These are delicious! So beautifully done Hyosun! They are so pretty and colorful. I have tasted these and know how delicious they are. Wish I had some now. They look so good. Hm, I tried to post a comment, but for some reason, I always have a hard time posting on your blog when using my wordpress credentials. Anyway, just wanted to say the photos are beautiful, not like mine when I wrote up the recipe a couple of years ago. We use spinach, egg, carrot, pickled radish and unarisushi. I can’t remember what we call it in Korean, but they are the fried tofu that you stuff with rice? We cut them into strips and use them instead of meat. Soyon – I’m sorry to hear you’re have a hard time commenting. You’re not the only one who said that, but I don’t know how to fix it. Fried tofu sounds good, but I’ve never used in my gimbap. I should try it. Thanks for stopping by! Mmm, yummy yummy! I have some danmuji in the fridge and now I know how I want to use it next! Thank you for sharing your recipe. I didn’t realize sesame oil gets added straight into the rice–I guess I have been preparing my rice more the Japanese way with vinegar and sugar all this time! hi erica – That’s the important part of Korean gimbap – seasoning the rice with sesame oil and salt. Some people add a Japanese twist by seasoning with vinegar and sugar. Thanks! I was also going to comment about the rice preparation. We always made it with vinegar and sugar and until I read this post and did some google search, I never knew that was not the traditional way to make kimbap. I guess we make it more Japanese style, what with the unarisushi addition, too instead of meat. I always love Kimbap, and my mom even makes it more frequently than Japanese sushi roll. 😉 I want to make it on my own using your recipe next time! Oh I bet your mom’s is delicious! This will be easy for you, Nami. Thanks! These look awesome. Do you know of a way to make these in advance? My mom says they should never be refrigerated and I don’t have time in the morning to make them. Mom’s always right! The rice will get hard in the fridge. These are best eaten on the same day. Is it possible for you to prepare all the other ingredients the night before and just make the rice in the morning and roll? These look nice. I think I will make this for lunch this weekend. Do I need to cook the beef? Good catch, Caroline! I’ve added a step. Thanks! What a wonderful picnic! I have to try making it! You make these look so perfectly! I thought my mom was the only one who could do that! Hyosun, I will never be able to make such beautiful, neat rolls like yours. I lack discipline and am too clumsy for this. Your choice of fillings is so colourful and interesting! Even though I have already made rolls with ground beef (horrible photos and clumsy rolls but a wonderful taste! ), I would have never thought of thin beef strips. I also love the Korean idea to add sesame oil. I am very curious about the taste, but I have always enjoyed sesame oil… Thank you for the inspiration! I have never made Korean rolls, only Japanese but I confirm that rolling gets easier and even if one obtains messy, unequal rolls, they taste heavenly, they are healthy and so much better than boring sandwiches. I have been making rolls for several years now and I always take them on long car trips instead of sandwiches. Sissi – I’m sure yours look as good. Ground beef is commonly used as well. It will certainly help with rolling if the ingredients are large pieces. It’s delicious with sesame oil. Try it. You’ll like it. It’s so funny because I had no idea ground beef was used in Korean rolls: I used leftover ground beef and seasoned it in Indian style. It was so good I have been repeating the same seasoning since then. Next time I have to do it Korean way! Now, I love “grown up” kimbap that has seasoned kimchi, perilla leaves and myulchi bokkeum in it. Spicy and delicious. Of course kids don’t like this as much. Thanks, Mabel!I love kimchi and perilla leaves in my kimbap as well. I haven’t had myulchi in it for a long time, but I remember having it when I was growing up in Korea. Gosh! 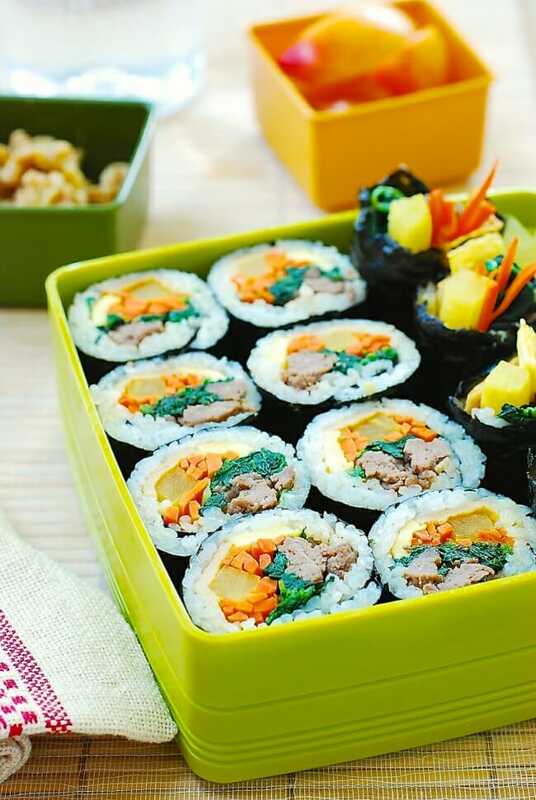 I am thinking of making this for a weekend picnic and your post come just in time 🙂 Thanks for sharing such a detail step-by-step Kimbap making 🙂 Can i omit the beef for this? Hi Ellena – Of course, you can omit beef. I think I’m going to do a vegetarian version next time. Thanks for stopping by! I like these rice rolls and it looks very easy to make. Thank you, Hyosun! Hi Ray – I hope you try to make them. It’s easy to make. Thanks for stopping by! Just found your blog today. 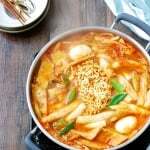 I’ve added you to my blogroll so I can have access to my favorite Korean recipes. I would love to learn recipes from my mother but we can’t seem to find the time to cook together. Anyway, great job and I love your pics. Just on a curious note, what kind of camera/lens do you use and who takes the pics when you are in the shot? Thanks! Thanks for the kind words! I use Nikon D80 with a 35mm f/1.8G lens along with a tripod. I take most of the photos myself even the ones with me in the shot (using the tripod and time delayed). However, my daughter happened to be home when I took these photos, so the three photos with my both hands in this post were taken by my daughter. Thanks for adding mine to your blogroll! I don’t know why it didn’t occur to me to use a tripod and time delay. Thannks for the tip! Looks delicious and so convenient because it’s portable. 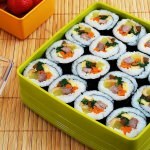 love it with tuna…chamchi kimbap!!! YUMMMM…. Chamchi is great in gimbap! Thanks! Before I stumbled to this page, my kimbap was never in great shape and makes me wonder why.Thanks for your tips now I know why. lol. Faaaaantastic 🙂 Is it ok to use shrimp or lobster instead of beef? Of course! It’ll be gourmet gimbap with those ingredients. Thanks! i was maked like this before,,i was used apple vinegar .. this one just sesame oil and salt.. definetl;y this one is better thanks for sharing ur woderful recipe i will try this surely . My favorite!! Kimbap used to be my favorite picnic food (well, it still is). It reminds me of all the picnic trips we went growing up! 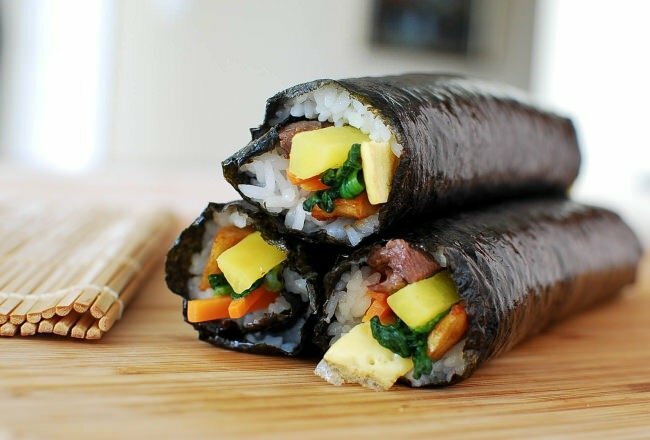 Mmm I am craving some Kimbap now! Kimbap!!!!! Aw, super love! It makes me hungry again!!!!! Thank you for sharing! My first attempt on Gimbap and I love it! I am so going to try your other recipe! I have linked up your recipe on my blog 🙂 Hope you don’t mind. This looks really delicious! But I think it’s hard to find the bamboo roll, if that so, is there any other way to roll it nicely without using the bamboo? Hi Stella – Yes, you can use aluminium foil. You can fold a large piece in half for durability and use it to roll gimbap. Or use parchment paper. Hope this helps. Happy cooking! Thank you again for a great post!! I used your recipe to make kimbap after so many failed attempts with other recipes. It was the first kimbap roll that my husband said “MAKE THIS AGAIN”. The sesame oil made the rice sooo much easier to work with and so much more delicious. Your pictures were so helpful so my rolls were very tight and beautiful. I made a kimbap version of spam musubi. Turned out really well!! Hi! Instead of beef, I want to use this pink sausage that’s sometimes used in this recipe. What is that called and where in the Korean supermarket can I find it? I know it’s not spam. It’s a Korean-style sausage (소시지). You can find it in the refrigerator section. Enjoy! Hi lina – I’m so happy to hear that. I bet you are getting quite good at it then. Thank you for letting me know how it turned out for you. Cheers! Refrigerate. You can reheat them in a pan over low heat or in the microwave. Thanks! Where can I find the pretty red or green square containers? The red one is Tupperware, the green one is from a Korean market. Hi, I tried this recipe. I made this for my Korean friends and they said it was a little bit bland. However, for me it’s totally delicious. Haha! I made my own Danmuji as the Korean grocery store is far from my house. Hope you can try my recipe too: http://www.marecipes.com/danmuji. wow that’s a nice looking danmuji. Nice idea to use tumeric. Did it have the tumeric flavor? How do we store the remaining dried seaweed? Keep it in a freezer bag, tightly closed, in the freezer. Hi Hyosun. I decided to enter some diet plan which consisted of 2 boiled egg. Half of white rice bowl and small piece of chicken breast. All this is for 1 day. Sometime I also change the rice to 1/4 boiled potato. I tried it for several days already bit even though I tried this once before, but now I feel so tired at the end of the day. And keep wanting to eat! Maybe it is because my weight is much bigger than that time but still..
Do you perhaps had a healthy but fulfilling meal recipe that helps with losing weight? I would like to lost 1.5kg a day at least if could. I will be great if I can eat healthy while losing weight with Korean dishes. Thank you for advice and recommendation. I had some from a restaurant, It had a light spicy taste. loved it. what are ingredients for this spicy taste? I’m going to try these recipes and would like ingredients for them. Your food looks so Authentic. It’s one of the most cultured foods we eat in our home. Other than American. Following you means I can experiment the foods I love! I’m dying to try these recipes! Thank you! Hope you and your family enjoy many dishes from my blog.